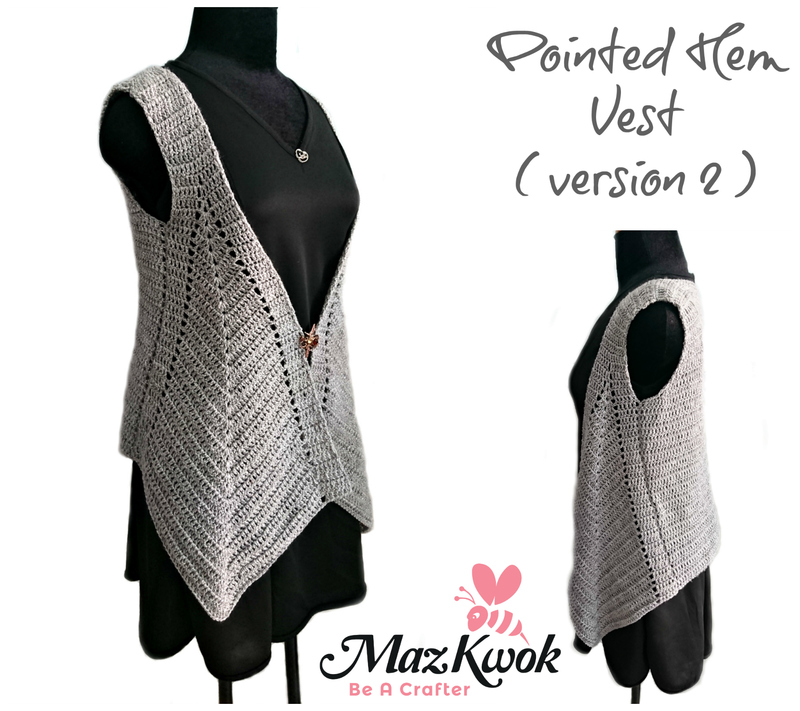 Another version of the Pointed Hem Vest crochet pattern I made. This one is also an opened front vest with V neck and inverted V lines of the hem. The differences are the shaped arm holes and flat tailed of the back. 2dc – V stitch: ( 2dc, ch1, 2dc ) into same stitch or space. 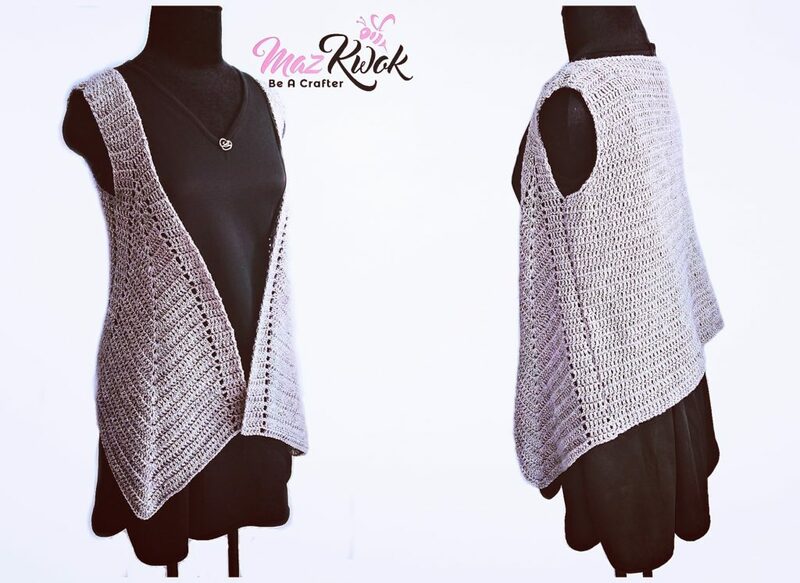 This crochet Pointed Hem Vest version 2 pattern fits size L ( chest size: 36 to 38 inches ). R1: Ch 80, dc into 3rd ch from hook ( first 2 ch doesn’t count as 1st dc ), dc across, total 78 sts, turn. R2: 78 dc across, turn. R31: skip 4 sts, insert hook and join yarn into next st, dc, (dec dc) x 2 times, 60 dc across, (dec dc) x 2 times, dc into next st, turn. R32: dc, (dec dc) x 2 times, 54 dc across, (dec dc) x 2 times, dc, turn. R33 to R44: 60 dc across, turn. R1: Ch 14, dc into 3rd ch from hook ( first 2 ch doesn’t count as 1st dc ), dc across, total 12 sts, turn. R2 to R10: 12 dc across, turn. R11: 6 dc across, ch1, 6 dc across, turn. R12: 6 dc across, ch1, dc into next ch1-space, ch1, 6 dc across, turn. R13: 6 dc across, ch1, skip next ch1-space, V stitch into next st, skip next ch1-space, ch1, 6 dc across, turn. R14: 6 dc across, ch1, skip next ch1-space and next st, 2dc – V stitch into next ch1-space, skip next ch1-space and next st, ch1, 6 dc across, turn. R15: 6 dc across, ch1, skip next ch1-space and next st, dc into next st, 2dc – V stitch into next ch1-space, dc into next st, skip next st and next ch1-space, ch1, 6 dc across, turn. R16: 6 dc across, ch1, skip next ch1-space and next st, 2 dc across, 2dc – V stitch into next ch1-space, 2 dc across, skip next ch1-space and next st, ch1, 6 dc across, turn. R17: 6 dc across, ch1, skip next ch1-space and next st, 3 dc across, 2dc – V stitch into next ch1-space, 3 dc across, skip next st and next ch1-space, ch1, 6 dc across, turn. R18: 6 dc across, ch1, skip next ch1-space and next st, 4 dc across, 2dc – V stitch into next ch1-space, 4 dc across, skip next ch1-space and next st, ch1, 6 dc across, turn. R19: 6 dc across, ch1, skip next ch1-space and next st, 5 dc across, 2dc – V stitch into next ch1-space, 5 dc across, skip next st and next ch1-space, ch1, 6 dc across, turn. R20: 6 dc across, ch1, skip next ch1-space and next st, 6 dc across, 2dc – V stitch into next ch1-space, 6 dc across, skip next ch1-space and next st, ch1, 6 dc across, turn. R21: 6 dc across, ch1, skip next ch1-space and next st, 7 dc across, 2dc – V stitch into next ch1-space, 7 dc across, skip next ch1-space and next st, ch1, 6 dc across, turn. R22: 6 dc across, ch1, skip next ch1-space and next st, 8 dc across, 2dc – V stitch into next ch1-space, 8 dc across, skip next ch1-space and next st, ch1, 6 dc across, turn. R23: 6 dc across, ch1, skip next ch1-space and next st, 9 dc across, 2dc – V stitch into next ch1-space, 9 dc across, skip next ch1-space and next st, ch1, 6 dc across, turn. R24: 6 dc across, ch1, skip next ch1-space and next st, 10 dc across, 2dc – V stitch into next ch1-space, 10 dc across, skip next ch1-space and next st, ch1, 6 dc across, turn. R25: 6 dc across, ch1, skip next ch1-space and next st, 11 dc across, 2dc – V stitch into next ch1-space, 11 dc across, skip next ch1-space and next st, ch1, 6 dc across, turn. R26: 6 dc across, ch1, skip next ch1-space and next st, 12 dc across, 2dc – V stitch into next ch1-space, 12 dc across, skip next ch1-space and next st, ch1, 6 dc across, turn. R27: 6 dc across, ch1, skip next ch1-space and next st, 13 dc across, 2dc – V stitch into next ch1-space, 13 dc across, skip next ch1-space and next st, ch1, 6 dc across, turn. R28: 6 dc across, ch1, skip next ch1-space and next st, 14 dc across, 2dc – V stitch into next ch1-space, 14 dc across, skip next ch1-space and next st, ch1, 6 dc across, turn. R29: 6 dc across, ch1, skip next ch1-space and next st, 15 dc across, 2dc – V stitch into next ch1-space, 15 dc across, skip next ch1-space and next st, ch1, 6 dc across, turn. R30: 6 dc across, ch1, skip next ch1-space and next st, 16 dc across, 2dc – V stitch into next ch1-space, 16 dc across, skip next ch1-space and next st, ch1, 6 dc across, turn. R31: 6 dc across, ch1, skip next ch1-space and next st, 17 dc across, 2dc – V stitch into next ch1-space, 17 dc across, skip next ch1-space and next st, ch1, 6 dc across, turn. R32: 6 dc across, ch1, skip next ch1-space and next st, 18 dc across, 2dc – V stitch into next ch1-space, 18 dc across, skip next ch1-space and next st, ch1, 6 dc across, turn. R33: 6 dc across, ch1, skip next ch1-space and next st, 19 dc across, 2dc – V stitch into next ch1-space, 19 dc across, skip next ch1-space and next st, ch1, 6 dc across, turn. R34: 6 dc across, ch1, skip next ch1-space and next st, 20 dc across, 2dc – V stitch into next ch1-space, 20 dc across, skip next ch1-space and next st, ch1, 6 dc across, turn. R35: 6 dc across, ch1, skip next ch1-space and next st, 21 dc across, 2dc – V stitch into next ch1-space, 21 dc across, skip next ch1-space and next st, ch1, 6 dc across, turn. R36: 6 dc across, ch1, skip next ch1-space and next st, 22 dc across, 2dc – V stitch into next ch1-space, 22 dc across, skip next ch1-space and next st, ch1, 6 dc across, turn. R37: 6 dc across, ch1, skip next ch1-space and next st, 23 dc across, 2dc – V stitch into next ch1-space, 23 dc across, skip next ch1-space and next st, ch1, 6 dc across, turn. R38: 6 dc across, ch1, skip next ch1-space and next st, 24 dc across, 2dc – V stitch into next ch1-space, 24 dc across, skip next ch1-space and next st, ch1, 6 dc across, turn. R39: 6 dc across, ch1, skip next ch1-space and next st, 25 dc across, 2dc – V stitch into next ch1-space, 25 dc across, skip next ch1-space and next st, ch1, 6 dc across, turn. R40: 6 dc across, ch1, skip next ch1-space and next st, 26 dc across, 2dc – V stitch into next ch1-space, 26 dc across, skip next ch1-space and next st, ch1, 6 dc across, turn. R41: 6 dc across, ch1, skip next ch1-space and next st, 27 dc across, 2dc – V stitch into next ch1-space, 27 dc across, skip next ch1-space and next st, ch1, 6 dc across, turn. R42: 6 dc across, ch1, skip next ch1-space and next st, 28 dc across, 2dc – V stitch into next ch1-space, 28 dc across, skip next ch1-space and next st, ch1, 6 dc across, turn. R43: 6 dc across, ch1, skip next ch1-space and next st, 29 dc across, 2dc – V stitch into next ch1-space, 29 dc across, skip next ch1-space and next st, ch1, 6 dc across, turn. R44: 6 dc across, ch1, skip next ch1-space and next st, 30 dc across, 2dc – V stitch into next ch1-space, 30 dc across, skip next ch1-space and next st, ch1, 6 dc across, turn. Written pattern and photos copyright Maz Kwok 2017. Please do not repost, republish or sell the content or photos as your own. You can sell the items you made from this pattern as long as you use your own pictures and give back proper credit. 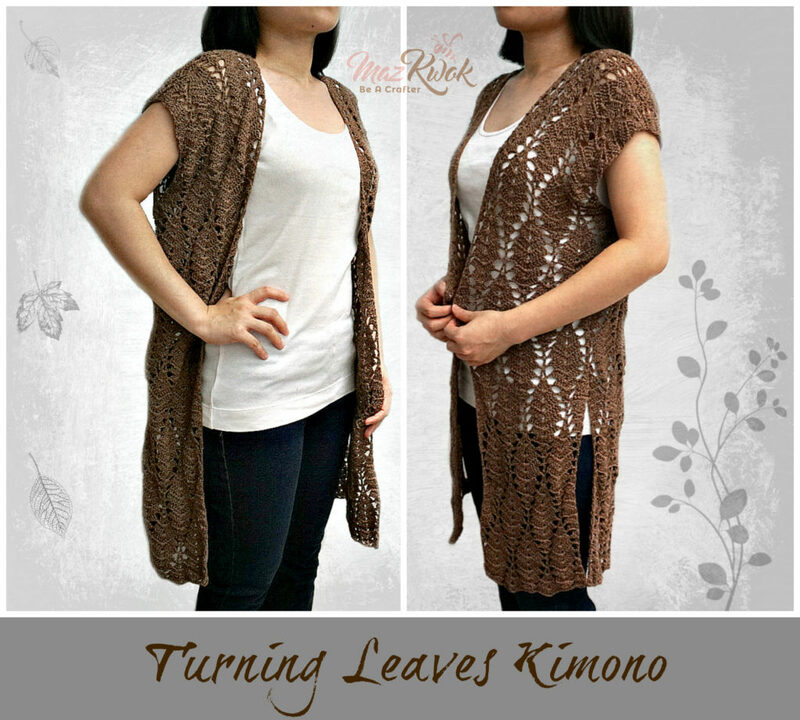 Please do share this pattern with others by link. For more info, visit my Copyright page. I love all your work, and as soon as I can afford the yarn I will buy some of your downloads. This vest is beautiful. Thank you so much for sharing.